RELAXING, QUIET TOWNHOME REMODELED TOP TO BOTTOM! This is a special villa that offers peace and privacy with home comforts and convenience in a beautiful tropical setting! It fronts directly on the Waikoloa Beach Golf course, with back views of distant mountains. This unit has been completely updated top to bottom with island-inspired décor, is roomy and comfortable and it is ready to become your home on the Big Island…offering so much more room and privacy then hotels or time shares. The 2-story villa has 2 lanais, soaring 19 ft. vaulted ceilings downstairs with expansive windows creating an open, airy feeling. This quality villa is spacious with over 1699 sq. ft floor space and features a brand new 65" flat screen smart television with cable. It is quiet and private with no neighbors above or below and is only steps to one of the two pools (without the noise of being too close). The open kitchen features granite countertops and seating at the countertop. There is also a ½ bath downstairs for your guests to use. The private master suite has its own lanai and a large, private bathroom and a king bed. The first of two guest bedrooms offers two twin beds with television and cable features a full bath right outside the door. The third bedroom offers a queen bed with television and cable. There is also a queen sofa bed for use in the living area. 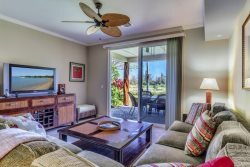 The two private lanais are perfect places to sit for coffee or wine with an unobstructed view of the Waikoloa Beach Golf Couse. This unit also includes; basic cookware, dishware, drinkware, regular coffee maker, blender, rice cooker, washer/dryer, hairdryer, bed and bath linens, iron, air-conditioning, wireless internet service, and reserved parking in the 1 car garage, and a reserved parking space #102 right outside the front door. There is plenty of beach gear; 2 beach chairs, 2 boogie boards, cooler and umbrella as well as beach towels for your use. The villa is at a premier location in the Waikoloa Colony Villa Resort gated complex, which has it’s own Jacuzzi spa, fitness center and tennis courts with two pools with BBQ grills. It is within the world destination Waikoloa Beach Resort with lovely A-Bay Beach, the Kings and Queens shopping centers, many good restaurants and the Marriott and Hilton Waikoloa Beach Resorts. The central location on the South Kohala Coast features an average of 350 days of sunshine a year and temperatures in the 70s and 80s, only varying an average of 5 degrees from summer to winter. Waikoloa Beach Resort has everything you need for water sports - snorkeling, dive boats, whale watch boats, equipment rental stores and more.